The AgustaWestland AW169, today known as Leonardo AW169, is a large multi-role utility twin-turboshaft Transport Category helicopter in the 4.6 tonne class, accommodating 8 passengers and 1 or 2 crew. The AW169 is a conventional configuration helicopter having a 5-bladed fully articulated interblade main rotor, an antitorque three bladed fully articulated tail rotor and a tricycle retractable wheel landing gear. The AW169 has a fully digital glass cockpit. Development of the aircraft started in 2010 as the AgustaWestland AW169; a derivative of the successful six ton AgustaWestland AW139 helicopter, sharing a large level of commonality across both components and the cockpit configuration. The AW169 is powered by a pair of Pratt & Whitney Canada PW210A Fadec-controlled turbine engines. The first of three prototypes AW169 (AC1 c/n 69002) I-EASF flew first at the Agusta Cascina Costa di Samarata plant in Italy, on 10 May 2012. The pre-serie helicopter (AC4 c/n 690050) I-AWCM flew on 31 January 2013. EASA certification was awarded on 15 Junly 2015. In January 2015, the assembly of the first production aircraft (c/n 69006) began in Vergiate, Italy, and the same year also activity on the AW169 commenced on a second assembly line in Philadelphia, Pennsylvania, USA. The militairy variant of the AW169 is the AW169M is the military version of the AW169. Over 180 AW169 helicopters have now been ordered by customers all over the world. On 10 February 2016, the first of six AW169 helicopters ordered by EMS-service operator Specialists Aviation Services was delivered. This AW169 c/n 69014 was testflown with Finmeccanica Helicopter Division test-registration I-RAIS and was registered G-KSST in the UK with Specialists Aviation Services ltd., Gloucestershire Airport, Staverton, on 8 February 2016. 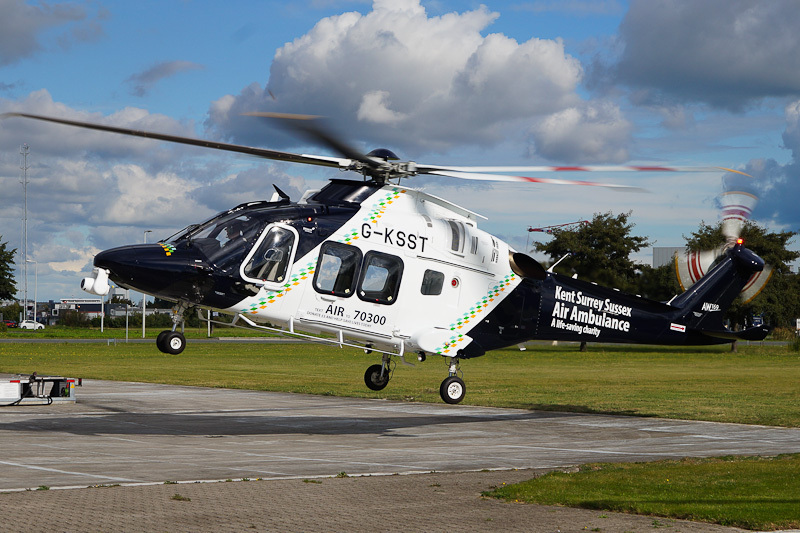 The G-KSST is operated for the Kent, Surrey & Sussex Air Ambulance Trust (KSSAAT), an independent charitable Air Ambulance operator in South East England, and replaces one of the two older MD902 helicopters in service. The helicopter is equipped with a nose-mounted Trakkabeam searchlight and a forward-looking tailfin camera. On 9 October 2016, AW169 G-KSST was seen in its Kent Surrey Sussex Air Ambulance colors at Heliport Amsterdam, when on its way to Helitech International 2016 in the RAI in Amsterdam.